Rich, well drained soil that holds moisture well. Beans, Cabbage, Brussels Sprouts, Cauliflower, Broccoli, Kale, Garlic, Onions and Onion. Sow in mid-spring, at about the time apple trees bloom. Sow fall crops in mid to late summer. Thin seedlings to at least 5 inches apart to grow large roots. Each seed is actually a multi-celled capsule, so you may need small scissors to thin plants to proper spacing. Weed carefully, and mulch between plants to deter weeds. 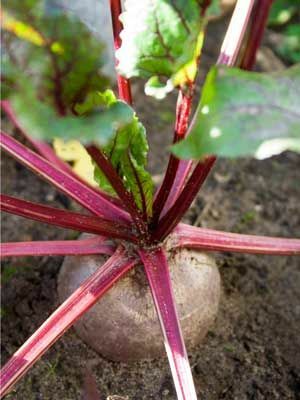 Baby beet greens often are included in salad mixes. Harvest young leaves for salad greens as you thin young plants. Pull roots when they become plump. To keep through winter, harvest plants, cut off the tops, and keep in a cool root cellar or refrigerator.